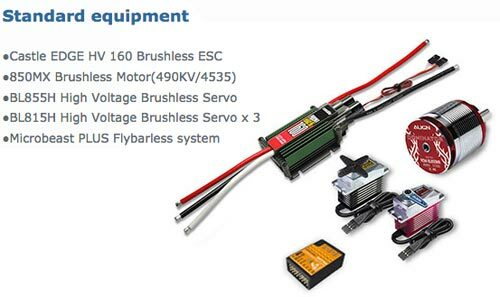 Nothing was spared in the electronics components of the kit: The mighty power of the 850MX(490KV/4535) motor paired with Castle Edge HV 160 speed controller for unparalleled power output; The new CNC machined aluminum cased BL815H brushless high voltage cyclic servos paired with BL855H rudder servo not only exhibited top of the line servo aesthetics, but also combine heat sink function and best performance in the market segment. The T-REX 800E PRO DFC can be described as the current top of the line flagship representing Align's superior product line. Based on the pedigree of pure 3D flight, the newest design concept with absolute top of the line equipment, along with superior aesthetics and attractive lines, the T-REX 800E PRO DFC will definitely elevate the adrenaline in your blood!